Embrace the Mayweather Swag: Is it a Black Thing? 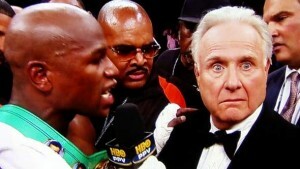 Floyd Mayweather telling Larry Merchant off. Floyd Mayweather vs. Victor Ortiz quickly became the undercard for Floyd Mayweather vs. Larry Merchant. During the post-fight interview, HBO’s Larry Merchant repeatedly asked Mayweather questions about his polarizing knockout of Ortiz. Floyd got tired of Merchant re-phrasing his questions about the knockout and simply lost his cool. He felt that Merchant never gives him the respect he deserves as a fighter. An argument ensued and Floyd, among other things, told Merchant he “should be fired because you don’t know s--t about boxing." Floyd may have went overboard on the 80-year old Merchant but it’s about time someone called him out. He’s been hating on black fighters for decades. His antagonistic journalism symbolizes the disdain America has for cocky black athletes. T.O. exercising for the media in 2005. It’s not just Merchant. It’s all of the fans and journalists around the country who vilify guys like T.O., LeBron and Kobe and praise Jeff Gordan, Larry Bird and Roger Clemens. Sure T.O. does sit ups for the media in his driveway and LeBron refers to himself as the King. At least they didn’t pull a Clemens and ask the team to allow them to take weeks off during the season to relax at home. Oh, and add in the demand for a $22-million dollar contract too. Talk about arrogance. Plain and simple, the confidence of a black man is a scary sight for America. Maybe because “swag,” as we call it, is spreading like wild fire. Brash cockiness is no longer just in the ‘hood. It’s in suburban living rooms too. Swag doesn’t mean a guy’s immoral. It just means he knows his capabilities and doesn’t have a problem letting you know all about them. It shouldn’t be seen as a threat. It should be embraced and shared to benefit the product on the field, court, and in the ring. 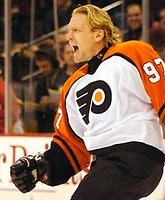 Former NHL star Jeremy Roenick said it best. Yea you’re right Jeremy. As long as you’re not black. The original article was published as Embrace the Swag at NJ Sports Addict, a blog by up-and-coming sports blogger, Nathaniel Ford.